How Can I Make the Best Use of My Follow-up Appointments? Strengths of "Managing Migraine: A Patient's Guide to Successful Migraine Care"
• You couldn't ask for better authors to speak to this topic. • This book is easy to understand, yet it doesn't "talk down" to us. • Learning points are boxed for easy review. • Images and illustrations add to the points made in the text. • Chapter 8: Building a Migraine Toolbox is exemplary with questions and checklists. • This book is valuable by itself or with its companion, "Managing Migraine: A Healthcare Professional's Guide to Collaborative Migraine Care." It's quite apparent that many years of cumulative experience, much thought, and great care have gone into this book. It takes us back - back to the very basics of communication between patient and doctor, doctor and patient. 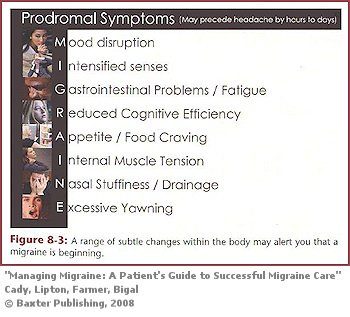 This is an issue which is all too often overlooked, yet it is one of the most essential elements of Migraine management. For patients: You can't go wrong with this book. No matter how experienced you are in communicating with your doctor and managing you Migraines, you can pick up a few tips here. For doctors: This is a great book to suggest to or give to your patients as an investment in better communication. Better communication with your patients will lead to better compliance and outcomes. For a review of "Managing Migraine: A Healthcare Professional's Guide to Collaborative Migraine Care," click HERE. 1 Cady, Roger K., MD; Lipton, Richard B., MD; Farmer, Kathleen, PhD; Bigal, Marcelo E., MD, PhD. "Managing Migraine: A Patient's Guide to Successful Migraine Care." Baxter Publishing. Hamilton, Ontario. 2008.